This game captures the thrill of America's pastime with home—run fun for family game night. "She steps up to the plate. Bases are loaded. The pitcher throws a curve. She swings... and hits it. It's up, up... and it's out of here! With a homerun, Mom wins game night!" 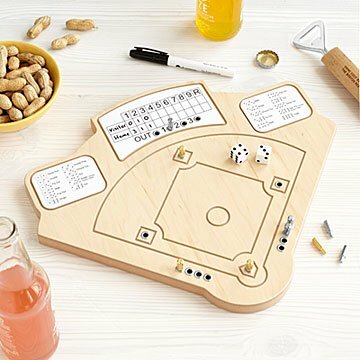 Bring the thrill of America's favorite pastime home with this old-fashioned game that'll be a hit with family and friends. To play, move the first batter to home plate and roll the dice. Locate the dice combination on one of the two outfield billboards and move your players accordingly. The dry erase scoreboard allows for speedy changes to team names and scores. Handcrafted in St. Louis by husband and wife team Ryan & Kim McDaniel, the game is made from beautiful maple wood veneer inserted with protective metal eyelets, and is built to last for generations. Turn off the TV, silence the smartphone, and gather 'round as you enjoy hours of old-fashioned fun with loved ones. Play ball! Game includes a pair of dice, dry erase marker, five chrome pegs, four brass pegs, and directions. What started as a hobby for husband-and-wife duo Ryan and Kim McDaniel has become their full-time gig. Armed with Ryan’s background in construction and Kim’s expertise in business and marketing, the pair crafts unique wooden board games designed to last for generations—and for kids and grown-ups alike to enjoy. Baseball Game is designed to accommodate two players or two teams of up to 4 players each. Fun Time and Well Built! This game is simple and fun. You can have quick games and get small tournament with friends or family. I bought this game as I was looking for a simple baseball game of chance and saw this one. The pictures of this game do not do it justice. This game is amazingly beautiful and will be a family keepsake! It is truly a work of art! Am sure this game will be used frequently with family members and friends. I like the product, but more is needed. I would like to see additional events that happen during a game. Maybe a card deck you draw from every time you throw certain doubles. They would cover errors, more strike outs, walks, balk by the pitcher, stolen bases, fan interference, etc.. Would bring a more baseball atmosphere to the game. Just a thought. Other wise it is fun to me. I finally got my stepdad a game he didn't already have! Loved the game - super cool! The game itself was made in a very high quality way. Looks great even just resting on a coffee table as a conversation piece. The rules are very simple and it's easy to pick up and play. Anyone who understands how baseball is played can easily play this without even reading the rules on the box. The only con is that the game is entirely random. It's really just seeing who's the "best" at dice rolling. It's very fun for parties or hanging out with friends, but I could see how a very competitive person wouldn't like losing with this game because the player really has no control of the outcome. But if you're the kind of person who handles winning and losing well, it's a lot of fun. Game for my son and I to play non-video baseball. It's a great game for teaching the basics of baseball! It's a high quality game board that could be handed down through the generations as well! Love the items in this catalog! Unusual and thoughtful.